INCREDIBLE! We love this flashy dress and jacket set by Bill Blass! The ensemble includes a gold, brown, and silver fully sequined cocktail dress with a moddish knee - length A - line silhouette that includes a high jewel neckline and short sleeves. 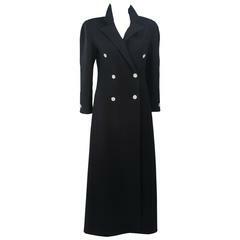 The jacket is knee - length as well, with long sleeves, a round neckline, and a straight - down - the - middle closure in front. The exterior of the jacket is plush, marled grey wool, the interior is lines in the same brilliant sequin fabric as the dress. 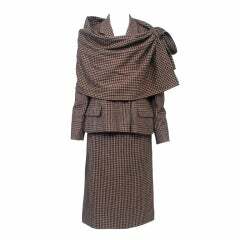 This unconventional set is fantastic, and can be worn together or separately, with each garment as a fantastic statement piece! Coat Measurements: Bust 36" Length 38"
Altered dress, has 1 1/2 &quot; seam allowances. 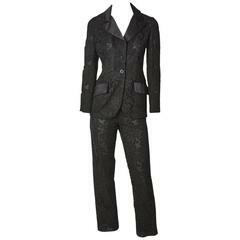 Bill Blass, black lace Tuxedo, pant suit, having satin lapels, and flap hip pockets. Pants are slim cut with back zipper closure. C. 1980's.